The alms bowl is one of the primary symbols in monastic life. Every monk and nun receives a bowl when they are initiated and carry it with them everywhere they go. They accept whatever food is offered for their nourishment and serve as a blessing for the giver. 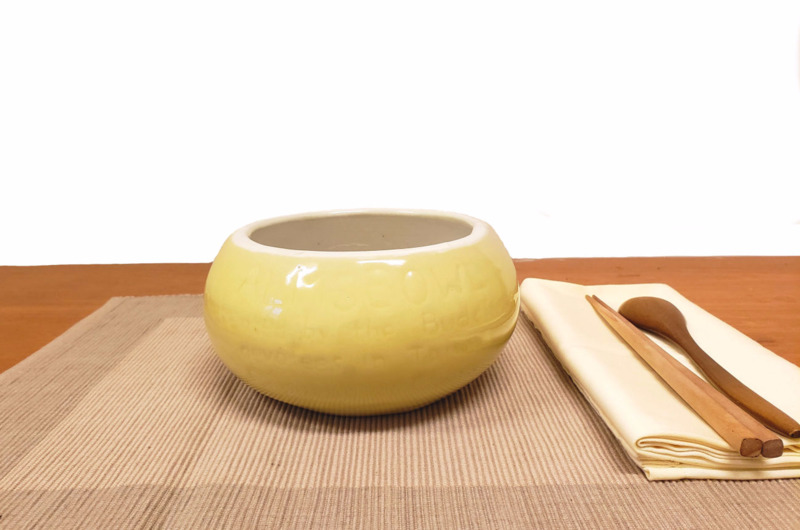 In this way, the bowl symbolizes the Middle Way between the giver and receiver. According to legend, the aesthetic Siddhartha practiced austerities until he was near starvation. A young woman offered him a golden bowl full of rice and milk, which he took. 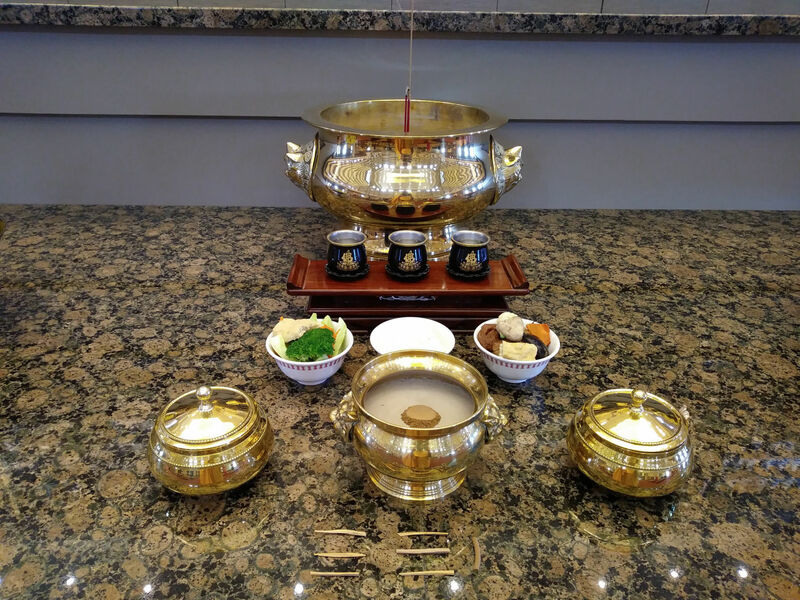 After eating, he threw the bowl into the river, as a symbol of renunciation. This story symbolizes another aspect of the Middle Way, which is to avoid extreme practices and extreme attachments. A mala usually consists of 9, 21, or 108 beads strung on a string. Each bead represents one. However, the bead is not alone, but is connected with all the other beads to make a whole strand. As individuals, we may think we are separate, but we’re not. We are connected to each other, to our family, to the world. We are all living beings together. One cannot exist without the other. This connection to life, we call the Buddha nature. 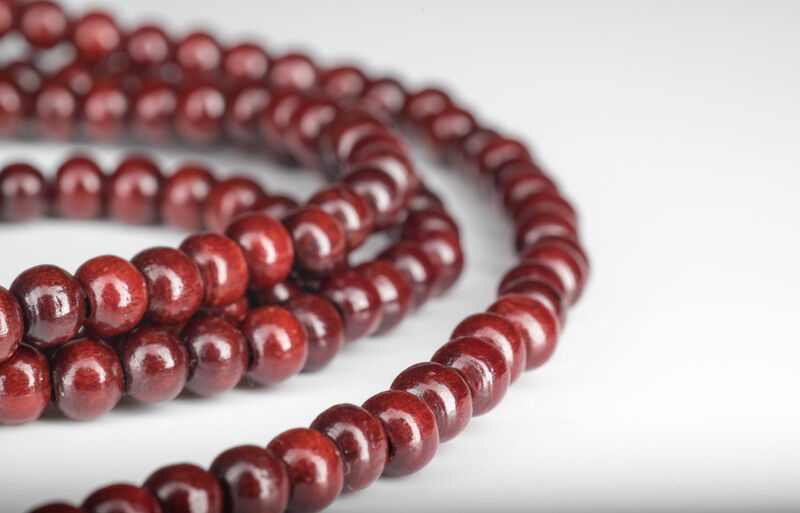 The idea of the mala is to move one bead at a time, focusing on a breath, a mantra, or a Buddha’s name, as in the Amitabha Sutra. This method creates positive spiritual energy. Since ancient times, temple bells have summoned monks and nuns to meditation and ceremonies. The gentle ring of a bell during chanting helps followers to focus on the present moment and let go of daily worries. A sense of peace and calmness can be enhanced by the sound of the bell. 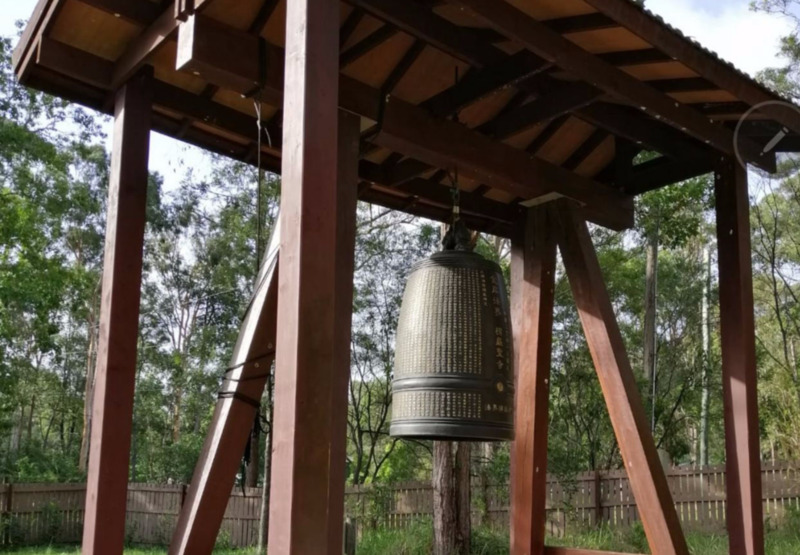 For this reason, wind bells are often hung on the eaves of stupas and temple to create peaceful and meditative spaces, with their tinkling sounds. The ring of the bell is a symbol of the Buddha’s voice. It also represents wisdom and compassion, and is used to call upon the heavenly deities for protection and to ward off evil spirits. Many old temples have bells at the entrances that one needs to ring before entering. Bells come in a wide range of sizes and styles. The Buddha achieved awakening under the shelter of a sacred fig tree known as the Bodhi tree. 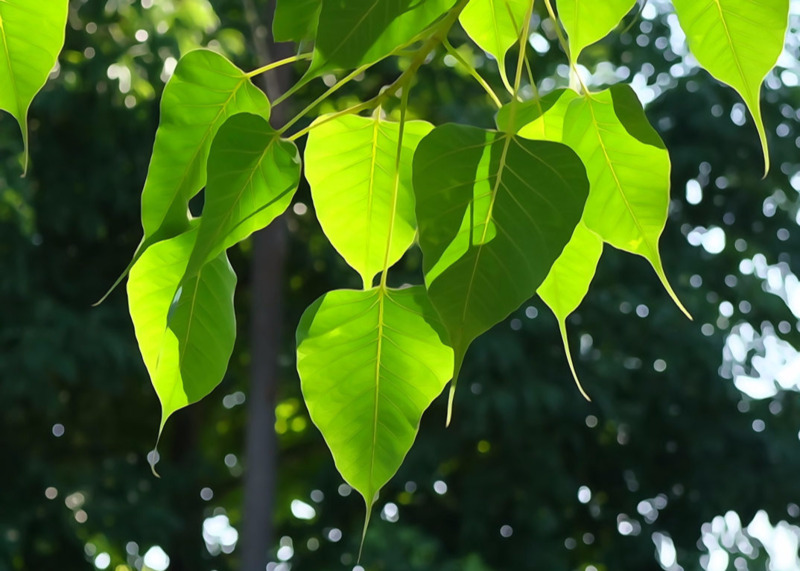 Since then, the bodhi tree has become a symbol of the Buddha’s enlightenment, and the heart-shaped leaf a symbol of the potential that lies within each of us to awaken. Bodhi is a Sanskrit word that means “awakening.” The term has two meanings for Buddhists. It denotes both the fig tree, ficus religiosa, under which Siddhartha Gautama became awakened and any tree under which any Buddha has awakened. The bodhi leaf is heart-shaped and exudes a bright and lilting energy. It speaks of playfulness and thoughtfulness. The bodhi tree still stands in Bodh Gaya, where the Buddha was awakened, as a descendant of the one under which the Buddha sat centuries ago. See Under the Bodhi Tree. 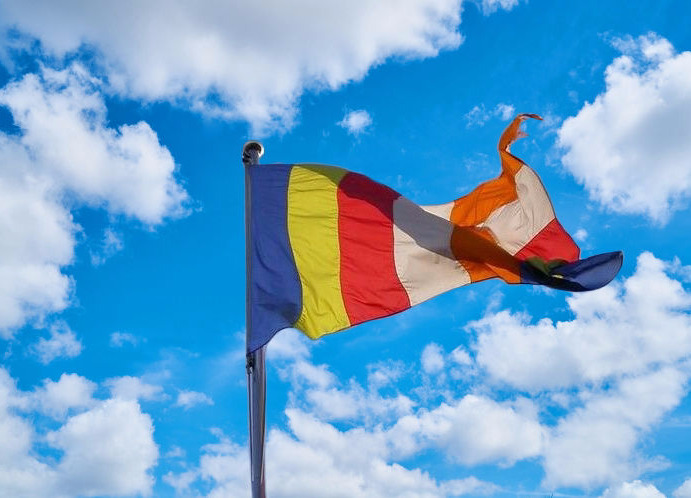 The six colors of the buddhist flag represent the six colors of the Buddha’s aura when he attained enlightenment. Blue stands for universal compassion; yellow for the Middle Way; red for blessings; white for purity and liberation; and orange for wisdom. The sixth color is the combination of the other colors and is not shown. The flag was designed in 1880 by an American journalist, Colonel Henry Steele Olcott. The horizontal stripes represent harmony among races, and the vertical stripes represent peace among nations, all under the shield of the Buddha’s wisdom. The dharma wheel is one of the oldest and most important symbols in Buddhism. It symbolizes the teachings of the Buddha and explains the process of death and rebirth with the eventual release from this endless cycle. The Buddha is said to have set the dharma wheel in motion when he gave his first teaching on the Four Noble Truths in a deer park near Sarnath to five aesthetics. In buddhist art, the deer flanking the dharma wheel signify the deer in the park listening to the Buddha teaching. This shows the Buddha’s compassion for animals as well as for humans. Buddhists regard the wheel's three basic parts as symbols of the three kinds of training in buddhist practice. The hub symbolizes moral discipline to stabilize the mind. The spokes denote the application of wisdom to defeat ignorance. The rim represents concentration, which holds the practice together. A wheel with four spokes stands for the Four Noble Truths. Eight spokes signify the Eightfold Path. Ten spokes represent ten directions, and twelve spokes signify the Twelve Links of Dependent Origination. 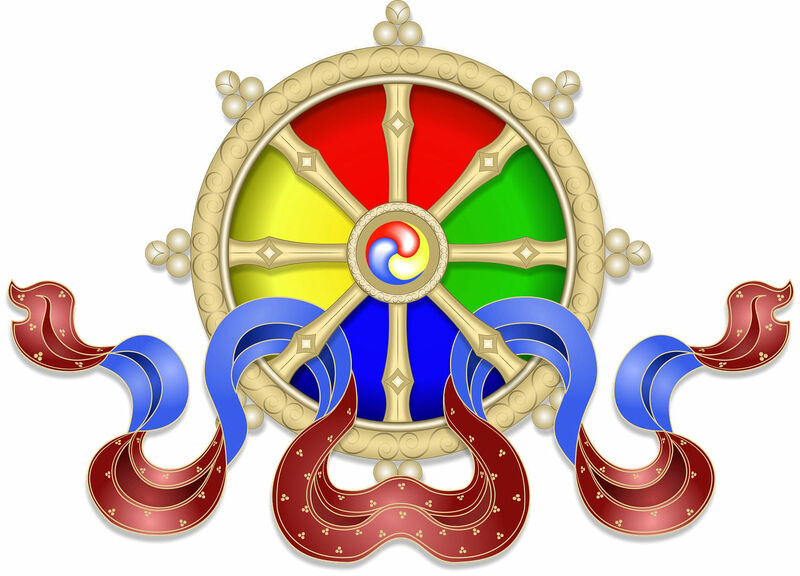 Twenty-four spokes signify the twelve links and their reversal--freedom from samsara, the cycle of death and rebirth. 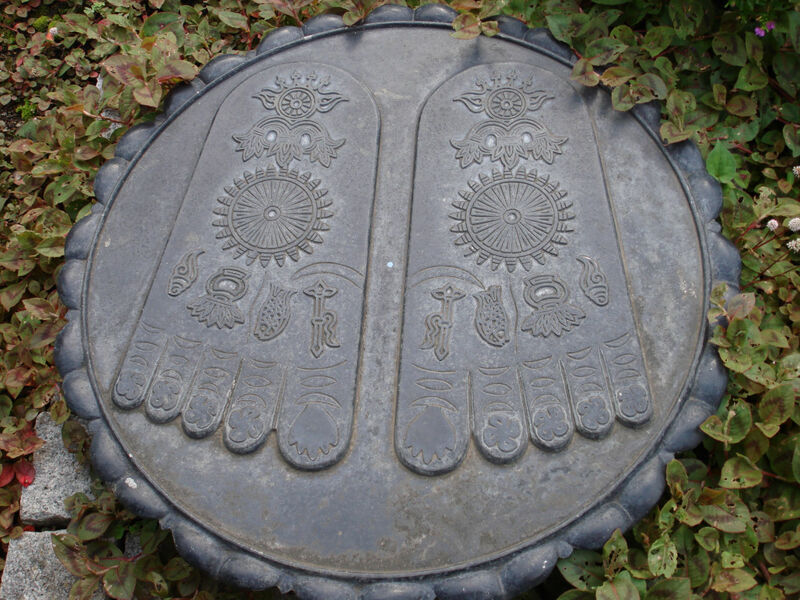 The Buddha’s footprints are venerated in all buddhist countries. They represent the teachings of the historical Buddha Shakyamuni and his continued presence on earth. The footsteps are a reminder of the path to be followed given by the Buddha and the possibility that we too can awaken. In buddhist legend, shortly before the Buddha died, he stood on a stone facing the south and left an imprint of his feet. These imprints have been reproduced in stone and in buddhist art all over Asia. They generally show all the toes to be equal in length and bear distinguishing marks, either a dharma wheel at the center of the sole, or the 32, 108 or 132 distinctive signs of a Buddha. The Eight Auspicious symbols appear on many of the footsteps. One of the most famous portrayals of the Buddha’s footprints is carved in stone at Bodh Gaya. Rubbings are often made by buddhists as sacred objects. 4. Light: Wisdom and the illumination of the darkness of Ignorance. 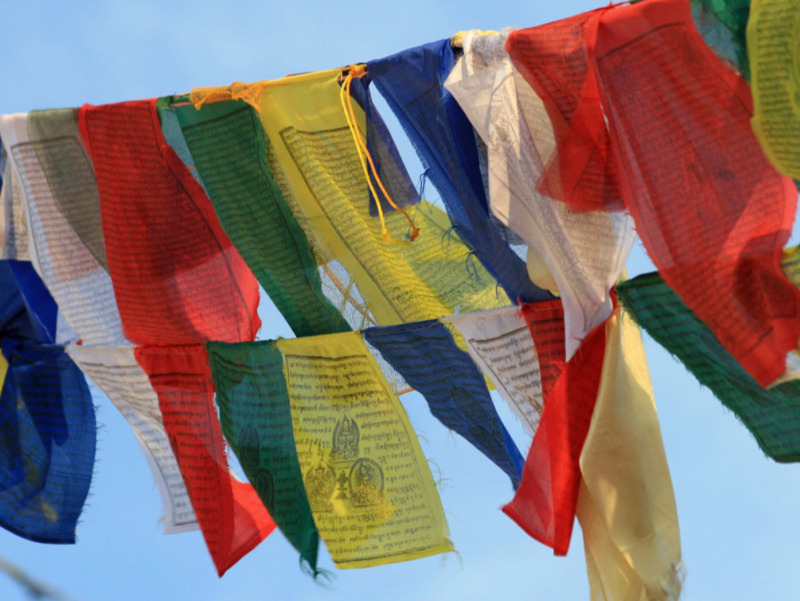 Buddhists of Tibet and Nepal hang prayer flags outside their homes, over mountain passes and rivers, and sacred places. The flags are said to promote peace, compassion, long life and wisdom. They are inscribed with auspicious symbols, prayers, and mantras. When the flags flutter in the wind, they are said to emit positive energy that pervades the area with happiness and well-being. Prayer wheels are used mainly by buddhists of Tibet and Nepal to spread spiritual blessings and well-being. 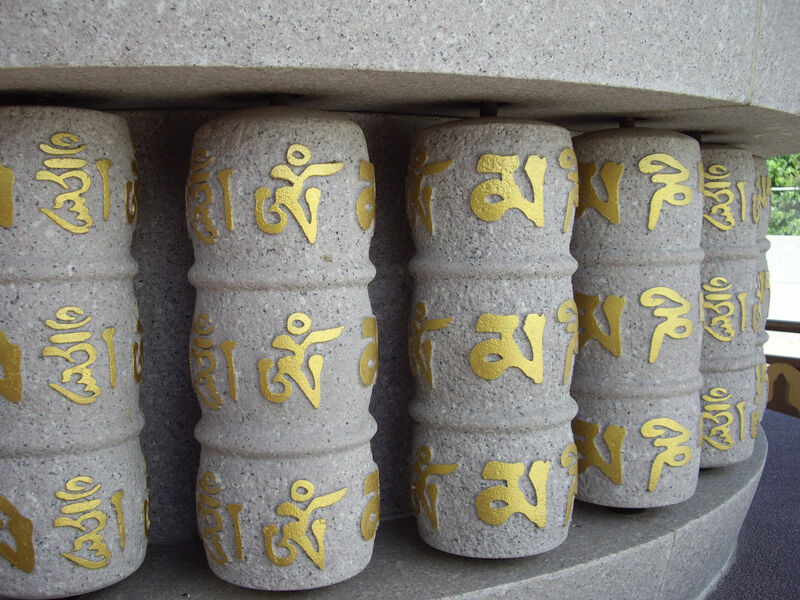 Rolls of thin paper, imprinted with thousands of copies of the mantra Om Mani Padme Hum or sacred texts, are wound around an axle inside the wheel and spun around and around. It is believed that the power of the spinning sound is as effective as reciting the sacred texts aloud. The vajra is a kind of battle club used as a ritual object to symbolize both the properties of a diamond (indestructibility) and a thunderbolt (irresistible force). It is fashioned out of brass or bronze, with four prongs at each end forming a lotus-bud shape that denotes peace or end in sharp points and become a wrathful weapon with which to stab. The vajra is used in both Chinese and Tibetan Buddhism. In Tibetan Buddhism, it is almost always paired with a bell during rituals. In Buddhism, vajra has three meanings: durable, luminous, and able to cut. Like the diamond, vajra smashes all devious influences, but is itself indestructible, as explained in The Vajra (Diamond) Sutra. Like the thunderbolt, its light breaks up the darkness. Like śūnyatā (the nature of reality), it chops away people’s afflictions and misguided views. 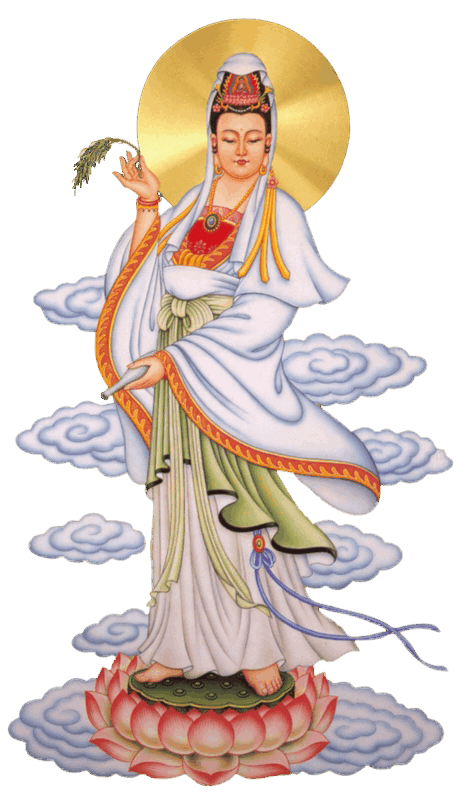 In her left hand, Guan Shi Yin Bodhisattva holds a vase or water jar that contains water, the divine nectar of life, a symbol of wisdom and compassion. This is one of the Eight Auspicious Symbols. In her right hand, she holds the branch of a weeping willow that is used to sprinkle the divine nectar of life upon those who revere her, so as to diminish their ill will and to wish them peace. The willow branch is also used to heal illnesses. It symbolizes the ability to bend (or adapt and change) without breaking.